The title track, Emotion, hooked me instantly. Every time I hear the opening beat it reminds me of a Paul Oakenfold song I heard on the radio a few years ago. I think it was called Faster Kill Pussycat. If you know it, tell me if you agree. 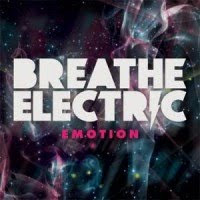 The beats are extremely catchy although not heard before by Breathe Electric. The chorus hooks with the secondary vocals before going back into the lead singer's lower pitched voice. This is a great electropop song and definitely introduces many new techniques into the band's arsenal of tricks. What Would You Say features the lead singer of a fairly well known band as guest vocals. The guest vocalist is Tom Higgenson from the Plain White T's. It's a pretty unorthodox combination of vocalists. The piano goes along with the electronics extremely well. It also seems more mainstream than usual. Tom Higgenson might even lead the song to top 40 radio. I wouldn't be surprised at all of that happens. It's different to hear Tom's voice electrofied instead of his usual raw vocals. He will get a lot of complaints for that. It is still a good song and definitely a highlight of the album. The Best Of All sounds like a song that Between The Trees would do if they were a little bit poppier. The piano led first verse definitely resembles Between The Trees. The first verse doesn't seem to go along with the rest of the song. The chorus sounds just like I Can Get Back Now by You, Me, And Everyone We Know. It's another song that is a lot less electronic than usual Breathe Electric. The last chorus includes another slow piano part that as earlier does not fit in at all. The song would be much better without those slow parts. Overall, the song is still pretty good. Let Go is another great song. It's pretty much a pure electronic track. The vocals are covered with Autotune throughout most of the song. However, Breathe Electric was always full of that. The whole song is extremely upbeat and there are almost no resting moments. The chorus is full of energy and is extremely catchy. It sounds different than every other song so far. The last album sounded pretty much the same all the way through, but this one definitely diversifies. The Average is a remade version of the song from the first EP. I can't notice too many differences between the versions. The vocals seem a bit more sustained and covered by more autotune. This was my absolute favorite song from the first album. It was extremely catchy and never got tiring for me. I have replaced the old version with this one. There isn't enough difference to carry both versions, so I decided that renovated is better. Pick whichever version you want, but you better download it. The Endless Fight is another totally different sounding track. It is another piano led track that is softer and less energetic. His vocals sound a little different but are still great. The chorus is basically a powerful chant. Also, uncustomary (for the band) guitar is throughout the song. This could be the beginning of a less electric BE. The guitar is definitely pleasing to hear after hearing so little beforehand. This song may have to grow on you, but it is definitely something good. This album is much different than their last. There is much more diversity within the tracks. Hopefully there will be a full length out sometime soon. Definitely something to look forward to. You can listen to the whole album on their myspace HERE. You can probably lock in your username so that no one else can use it on your particular blog. It's probably on the site some where. Look around.